Here's a card I made to join in some challenges - but I'm not sure now whether it actually qualifies for one of them! I stamped the dog, masked it and added sky and stencilled grass. The sun and sentiment are from a Hero set. I coloured the dog and sun with Promarkers. The whole card was inspired by the 'dog days of summer' theme at Dragonfly Journeys and I think the sun also meets the 'hot' theme at Shopping Our Stash . 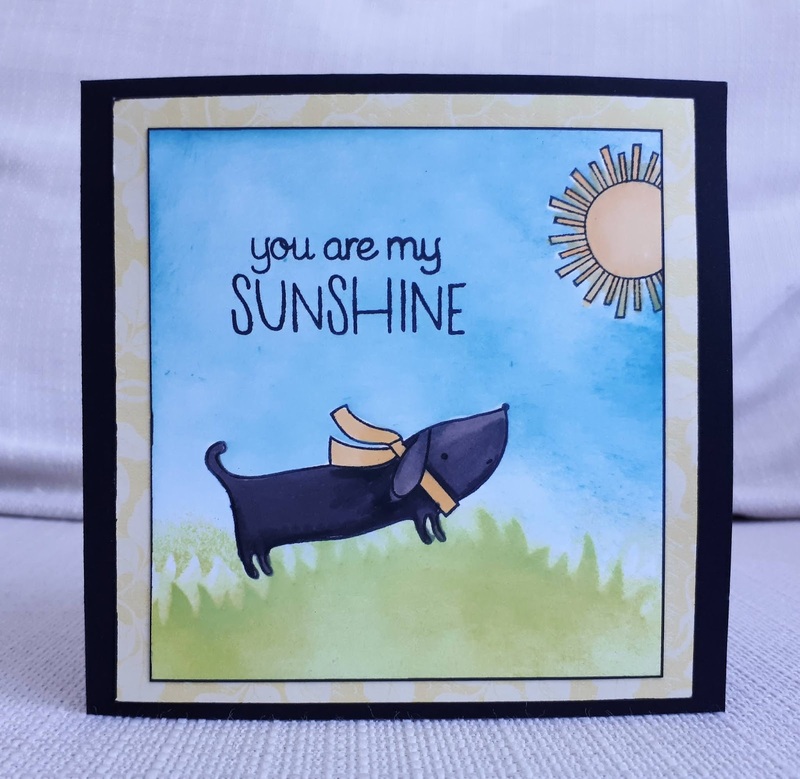 The colour theme of the dog and sun was chosen by the challenge at Cards in Envy , 'yellow and black' - but now I realise that by adding the background, I may have disqualified myself! I'll enter anyway and apologise if you think I'm a rule breaker. It’s super sweet this doggie enjoying the outdoors in the sunny weather. You colored the dog well, coloring with black promarker Is kind of tricky I think. Super cute card! Love the wee wienee pup! Thanks for getting HOT HOT HOT with the crew from SHOPPING OUR STASH! Very nicely crafted! Thanks for sharing with us at Shopping Our Stash! So cute! From the thumbnail I thought it was a little pig! Ha! I love the doggy! Thanks for sharing this with us at SOS this week. 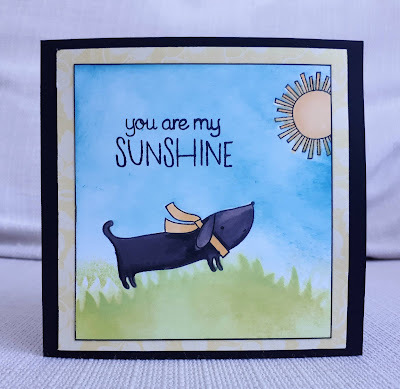 Your card is adorable with the puppy and the sun! There's enough yellow and black to meet the challenge. Thanks so much for joining us at Cards in Envy.